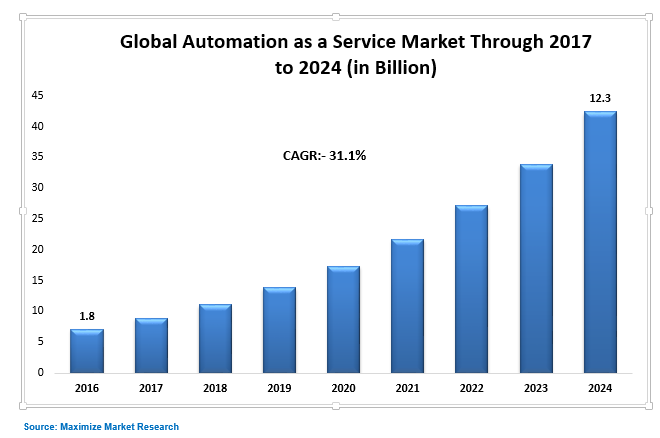 Global Automation-as-a-Service Market is expected to reach USD 12.3 Billion by 2024 from USD 1.86 Billion in 2016 at a CAGR of 31.1%. Rising adoption of automation and the technological advancements taking place and the swift growth of the adoption of cloud technology are the key driving factors for the growth of the market in the forecast period. The increasing demand of the cloud technology. Maintaining data security and privacy will augment the market growth. Higher adoption among the SMEs and ability to generate a positive RoI brings an opportunity to market. Lack of awareness and skilled workforce are key challenges before automation as a service market. Automation-as-a-service solutions and services are used for various business functions, which include information technology (IT), sales and marketing, finance, operations, and human resource. Sales and marketing business function are anticipated to witness the highest CAGR owing to increasing need for sales and marketing departments across industries, to automate various repetitive and mundane tasks that utilize a lot of time of the sales and marketing representatives, which can otherwise be used for beneficial tasks such as customer acquisition and retainment. Automation-as-a-service market end-use segment includes banking, financial services, and insurance (BFSI), telecom and IT, retail and consumer goods, manufacturing, healthcare and life sciences, energy and utilities, transportation and logistics, media and entertainment, government and defense, and others (travel and hospitality, and education). BFSI segment is leading the market while healthcare and life sciences industry is expected to witness the highest CAGR during the forecast period because of the increasing need for managing the growing data coming from various patients, maintaining their records, and automating the repetitive tasks. The Asia Pacific is predicted to be the highest growing region in the automation-as-a-service market owing to the increasing adoption of automation and cloud technologies, and government initiatives, in developing countries, including China and India. North America is expected to continue being the largest revenue-generating region for the automation-as-a-service vendors. Presence of various developed economies, such as Canada and US and high focus on innovations in R&D and technology across industries is driving the market growth in North America. North America Healthcare Mobility Solutions Market – Industry Analysis and Market Forecast (2017-2024) – by Product & Services, Application, End User, and Geography. Asia Pacific IoT Software Market – Industry Analysis and Forecast (2016-2024) by Type, Application, and Geography.